Bundesliga | The 10 worst Bundesliga kits of all time! The 10 worst Bundesliga kits of all time! Everyone loves a bad kit. In fact, it's a curious twist of fate that these fashion fails are often better remembered than countless lovely strips produced down the years. These awful numbers tend to take on a life of their own and go into folklore - for better or worse. What looks like a run-of-the-mill garish orange third strip is actually, on closer inspection, made significantly worse by pale black dots running up and down. Why? Toni Polster might look relaxed, but our eyes hurt. This is a bad colour combination. Brought out in honour of Fastnacht, a jesters' ceremony (see the club badge) that initiates carnival season in southern Germany, Mainz wore this one - on Matchday 19 of the 2015/16 season in a 1-0 win against Borussia Mönchengladbach. How hard can it be to mess up royal blue? Following a 3-1 defeat on home turf to Stuttgart, this shirt failed to live long in the memory of Cologne fans. If you're wondering why everything is upside down, it's because the theme of that year's carnival was "Mer stelle alles op der Kopp," or "We'll turn everything on its head". Alexander Zickler models Bayern's 1995/96 away kit. This is a sensationally bad away kit from the Eagles. An Oktoberfest-inspired shirt, this kit becomes even stranger when you notice that it has "think blue" written on the front. One to live long in the memory for the wrong reasons. In all their glory, here are Bochum's three kits from the 1998/99 season. 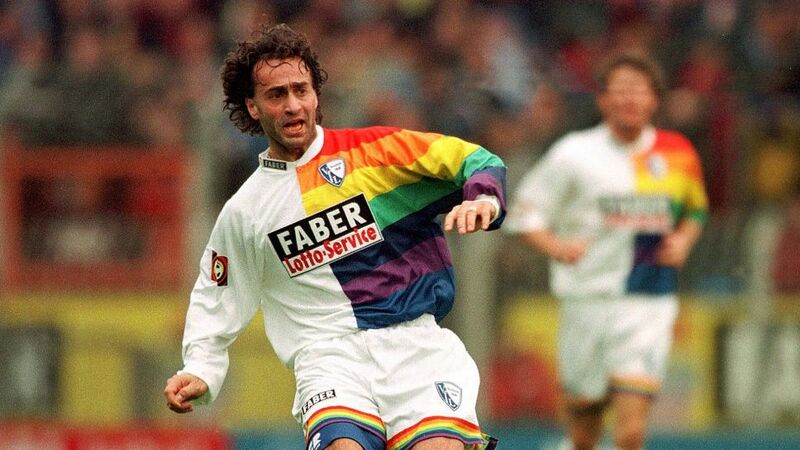 Not content with one garish rainbow on their shoulders, the Ruhr district club went for it on all three kits. Points for consistency, we suppose.